Enjoy endless adventures at the busy Minecraft™ village. This hive of activity features a library, blacksmith, butcher and a marketplace. Have the iron golem patrol the streets to ward off zombies and other hostile mobs. Join forces with Alex, and combine your Minecraft know-how to mine, craft, create, grow vital crops and tend to the livestock. But keep an eye out for the exploding Creeper™ and the enderman that roam after nightfall! Last known price is 14% above the initial Lego retail price! 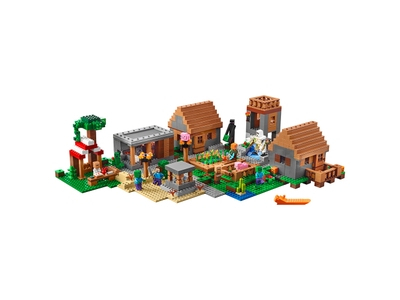 The The Village (21128) Lego set is no longer directly available from the sites below. However, 3rd party partners of these sites might still have the set available. Alternate description Experience The Village with a watchtower, library, blacksmith, butcher and marketplace, plus 4 minifigures, Creeper™, enderman, pig, baby pig, iron golem and 2 villagers. Fold out the library and butcher's buildings and lift the marketplace roof to access the interiors. This set includes over 1,500 pieces.